We have a long time to create websites for real estate agencies and have achieved great success in this field. Our sites became prize-winners or nominees of national and regional professional competitions Realtors. Your web site for real estate will have a web module of "Hot" (or exclusive) proposals, the display module of your objects on the map (for example on the website "Coliseum") will necessarily take the form of sending the application for each (or selected, bookmarked) objects from your site or online consultant. Can also be installed module login to the site through social networks, the module objects on the basis of the recommendations have already viewed objects, as well as auto-save search parameters property or forums and message boards, vacancies, consultations. Our new module will automatically work with the content (Objects, News, Articles, Export, RSS) essentially save you time when working with your site. Module Export objects to bulletin board, realty sites. Development of 3D-models of houses/buildings, based on your floor plans, and placing them on the site. New! The budget of this project — start $1500. Development time — from 2 to 3 months. 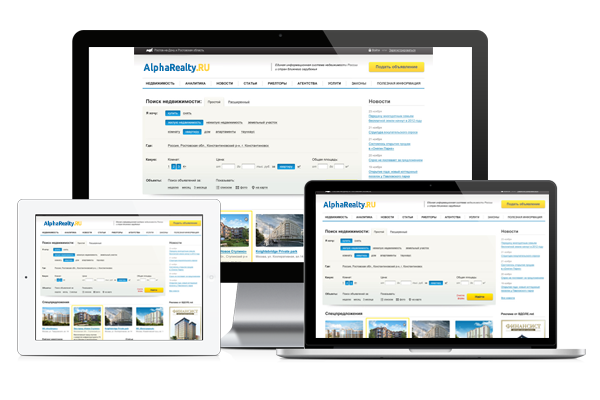 Some examples of sites for real estate agencies, created in our web-studio. All of them have an original design, are made in accordance with the corporate style of agencies and allow the user to present all real estate objects in an accessible and understandable form.